There are been several cases where ideas behind startups have emerged in a café while sipping a coffee. However, in the case of Sameer Grover, it went a step further, as he managed to build a product based on the instant feedback from his potential customers right there. 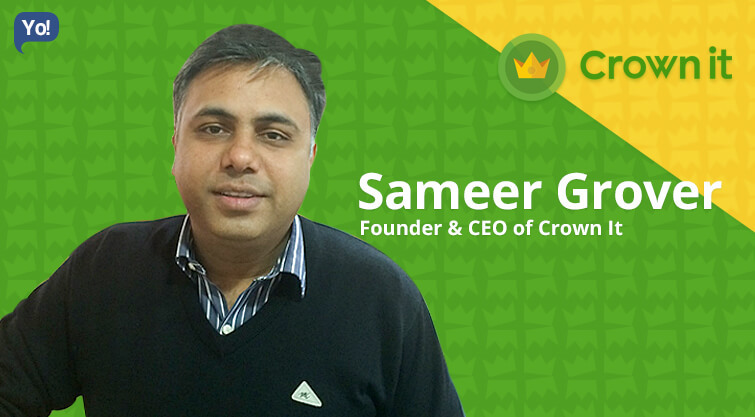 Sameer is a serial entrepreneur and a quintessential product person. He has had extensive experience creating and marketing software products for large as well as small enterprises. After completing his BE in Civil Engineering he went on the get ample experience in various organization. He also worked in various leadership positions ranging from healthcare, technology and cloud telephony. He is a dynamic and passionate leader who has led development and launch of award winning products. All this prominence is the core reason behind his action to lead his own company Crown It. is a mobile app, which is set to revolutionize retail business in India. Customers get cash back each time they visit and spend on retail outlets through a customer club. Crown-it is an app-only, hyperlocal merchant discovery and privileges platform. It operates an O2O (Online to Offline) platform that allows local merchants to list themselves and attract consumers. It helps consumers with their buying decision by offering them curated and personalized eating out and shopping options based on their spending habits, interests and social data, with Cash back benefits. Crown-it also enables the merchants to create customized deals – which are dynamic, hyper local and targeted to specific audiences based on their gender, location, spending and eating habits, and day of week & time of day etc. The merchants are, in turn, charged a percentage of business driven to them. I was always interested in the consumer deal space. As a regular user of said space myself, I felt there was a lot of friction in the coupon model, at both the merchant and the consumer end. I wanted to create a smoother deal model that is fun and engaging for the customers and result- driven for the merchants. It is to have fun in whatever I do. That is my true mantra to life and success! The biggest challenge was to convince the merchants that our model is going to work. Skepticism ran high and tiding over their misconceptions over new ventures was a murky area of sorts. Earning their trust and getting them on-board was difficult. By delivering what we had promised. We have earned the trust of the merchants now and that has solved half of the problems for us. Crown-it had it’s inception in March, 2014. We had raised series-A funding of $5.5Mn from Accel partners and Helion ventures in May-2015. Prior to that we had raised $300,000 of Angel investment in three rounds. We believe that the employees of Crown-it are its core strength. Every team can independently decide on product features, marketing campaigns and implementing ideas. Exciting work environment and immense growth opportunities provides the job satisfaction that the employees look for. Making a phone call instead of sending an email. I often find myself battling with procrastination. Ideally, I would like to adopt better discipline and prioritization. Keep it light; Keep it fun! Dream big and your dreams can come true. I plan to position Crown-it in 25 cities across India by 2018, with an approximately 20 million users and drive annual GMV of $1.2Bn across various categories. I would become an entrepreneur right out of college.